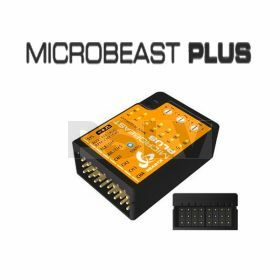 MICROBEAST PLUS is based on the popular MICROBEAST and starts the next level of the BEASTX flybarless revolution. MEMS sensors of the latest generation measure the aircraft′s rotational movement with unprecedented precision and transmit the data digitally and in real time to the control system. These new sensors are insensitive to typical vibrations of a model helicopter. The housing made of plastic composite material keeps the weight of MICROBEAST PLUS sensationally low. thus customize the unit specifically to their needs. StudioX for Windows & Mac is available for download at www.beastx.com.